Note: unless noted otherwise, all images are from history.naval.mil. 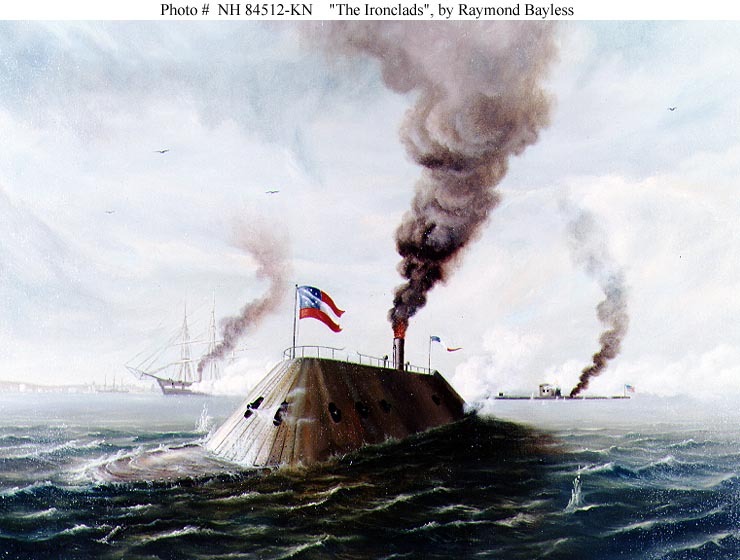 On March 9, 1862, during the American Civil War, naval warfare changed forever when the new ironclads Monitor and Merrimack fought each other. This first duel between ironclads could have been ripped from the pages of a Jules Verne sci-fi novel. But it was real, and it profoundly influenced naval warfare and warship design ever after. 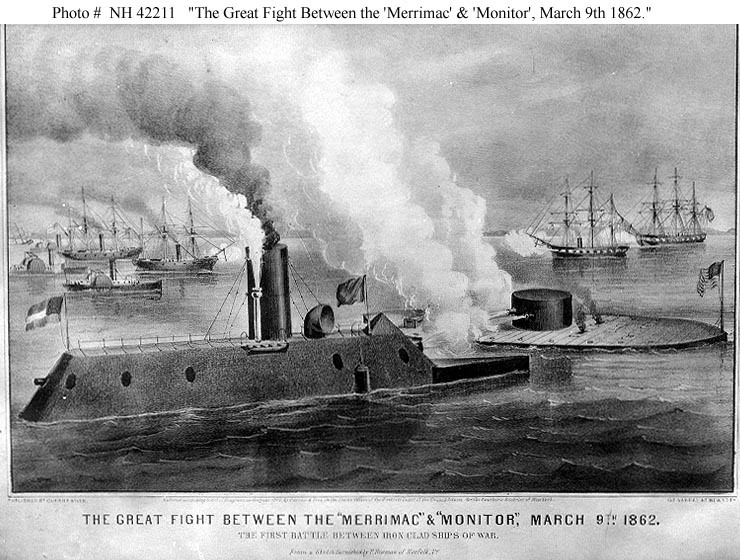 The Battle of the Monitor and Merrimack. 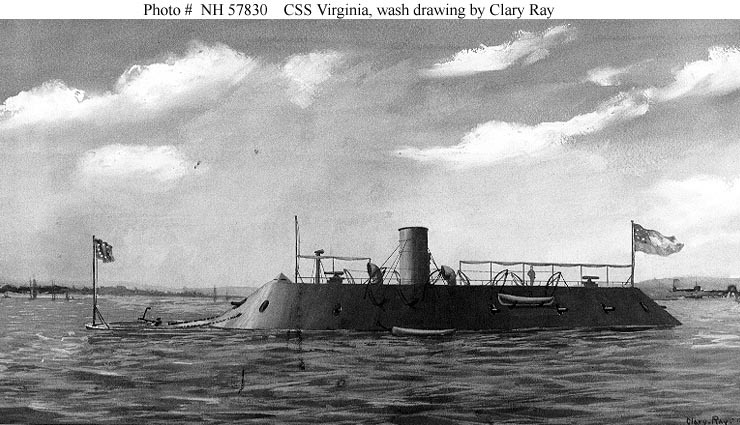 The day before, the Confederate vessel Merrimack, officially called CSS Virginia, sailed on her maiden voyage armed with six 9" Dahlgren cannons, four smaller cannons and a menacing iron ram at her bow. Her sloped superstructure was made of 24" of thick wood and 4" of iron plating. She was solid and imposing. 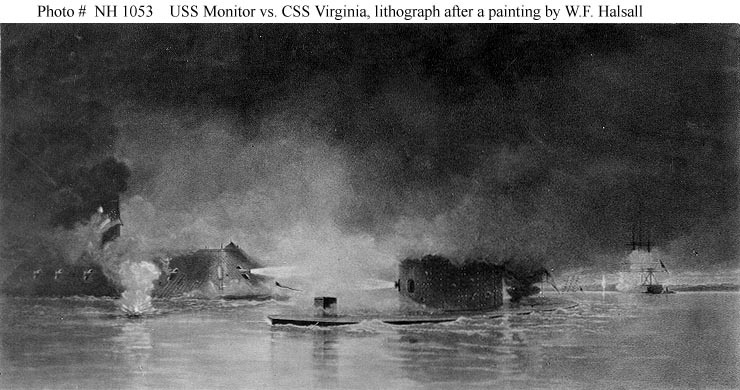 She sank USS Cumberland and then destroyed USS Congress. 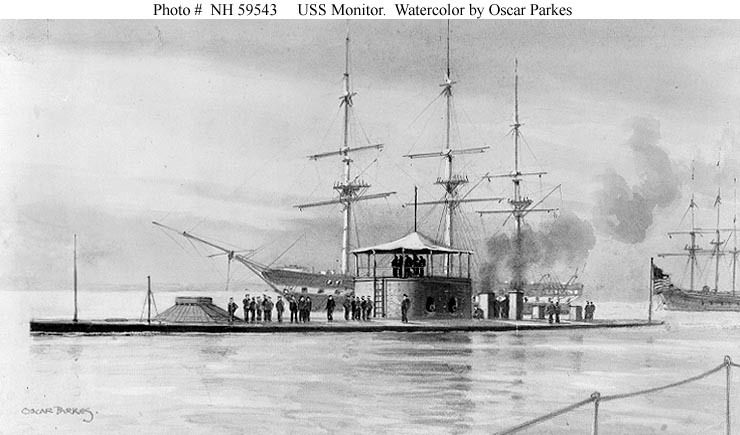 A third warship, USS Minnesota, ran aground out of the way of Merrimack. It was a stunning victory for the South and the greatest defeat ever for the US Navy. Now, seemingly unstoppable, she was threatening to spoil the Union blockade, a key part of the Union's strategy to win the war. 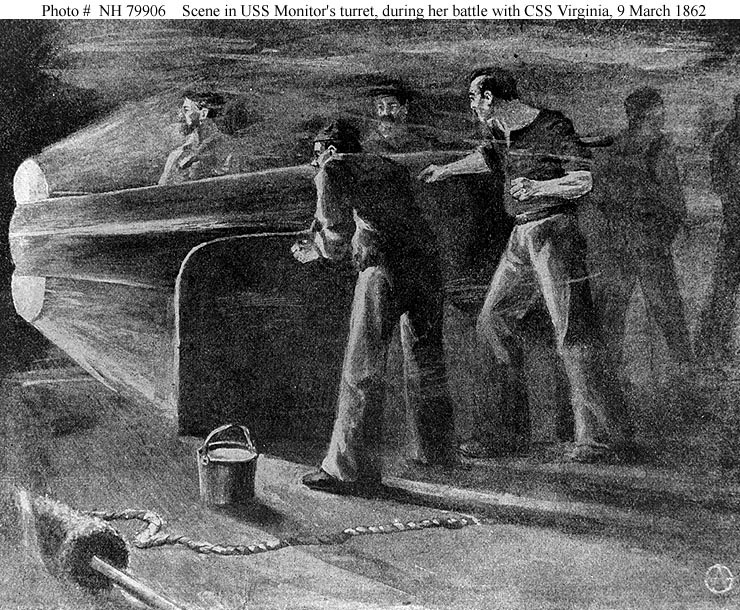 But that night, the radical USS Monitor appeared from the future or, more precisely, from her Brooklyn shipyard on the East River 270 miles away. Monitor was the brainchild of a brilliant Swedish immigrant named John Ericsson. He had designed her as part of a Federal program to counter Merrimack, which the Union knew was under construction. The catch was that the Union was so far behind that Monitor had to be built in record time: 90 days. Monitor had been sailing south since March 6, just a few days after being commissioned. She was a marvelous little ship and a paragon of design efficiency. Her crew was only 59 men. She lacked masts. She lacked sails. With her solitary 20' diameter turret covered in nine inches of armor, two 11" Dahlgren guns, and a flat iron-plated deck just inches above the waves, she was hardly recognizable as a ship at all. And yet the sum was greater than the parts. She was so advanced that she had 48 different patentable inventions. She pioneered the configuration of metal hull, metal structure, turrets, standardized main armament, steam propulsion and no sails, and thus influenced nearly every class of gun surface warship that has followed. Now she floated next to Minnesota, ready to play David to Merrimack's Goliath. On the morning of the 9th, the Confederate sailors aboard Merrimack anchored at Sewell's Point, having the most feared warship in the world for a day, wondered what they faced as the little Monitor approached. Their new adversary was 100 feet shorter and displaced a quarter as much. No one had any real idea of which tactics to use or what would happen next. What little had been worked out in advance was all theoretical. Regardless, the crew of the Monitor knew one thing: Merrimack must be stopped. Merrimack's intrepid captain Franklin Buchanan had been wounded the day before. Replacing him was a serious sailor with an unusual name: Catesby ap Roger Jones. Starting at about 8:00 am, the two ships raised their anchors and made for each other. At about 8:30 am, Merrimack opened fire on Monitor, missed, and hit Minnesota instead. Monitor replied. The battle now turned into a series of very infrequent, yet thunderous cannon volleys. Over the next four hours, the two ironclads circled and fought relentlessly as other ships watched. She also exchanged at least one broadsides with Minnesota. "I opened upon her with all my broadside guns and 10-inch pivot (cannon) a broadside which would have blown out of water any timber-built ship in the world," recalled Minnesota's captain Van Brunt. Merrimack retorted twice with her bow gun. The first shot drilled Minnesota, tearing up four rooms and setting the ship on fire. The fire was put out quickly. The second shot wrecked USS Dragon, a steam tug working to extricate Minnesota off a sandbar, by putting a shot through her boiler. Minnesota kept firing, but though at least fifty solid shots hit her angled flanks, they did so "without producing any apparent effect," reported Van Brunt, also noting that by now, his flagship was "badly crippled." Furthermore, having expended about 530 cannonballs, he was very low on ammunition. For all practical purposes, Minnesota was TKO. This was the view from Fort Monroe, looking southwest into Hampton Roads. 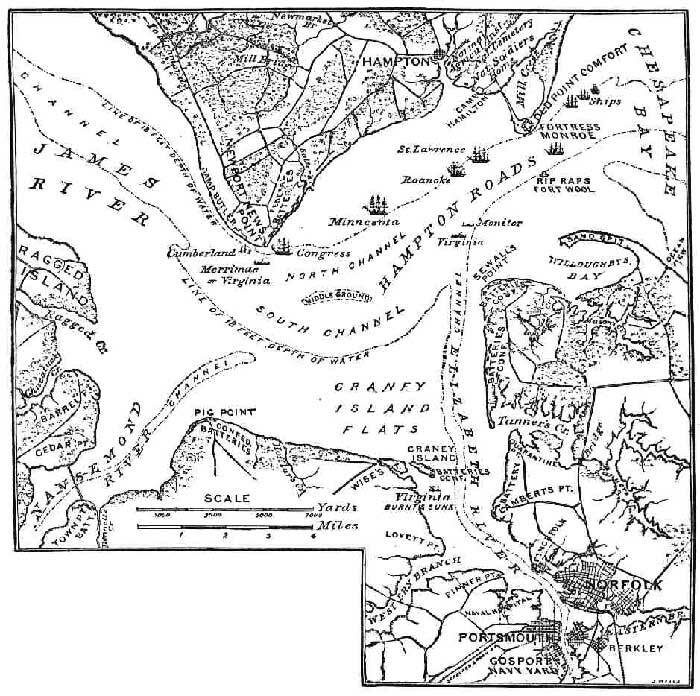 Sewell's Point is at top left while Newport News Point is at right. Defensively, both excelled. But offensively, each faced significant constraints. Merrimack had weak engines, a 22' draft, and shells that fractured easily against Monitor's thick armor. Monitor's regulations forced her crew to use just half the gunpowder used normally, reducing the advantage of her powerful cannons and solid 175-pound cannonballs. Neither penetrated the other's armor, but they were remarkably accurate. 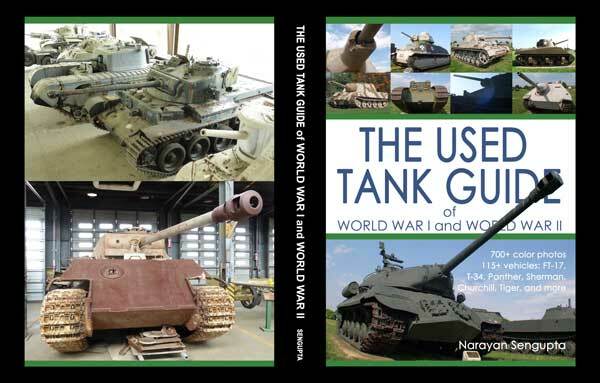 Merrimack hit the tiny Monitor 22 times, a testament to the point-blank range of the combat! At one point, Merrimack tried to ram Monitor, but essentially ran over her low deck and injured herself against Monitor's sharp armor. "She will not try that again," wrote one satisfied Monitor officer. 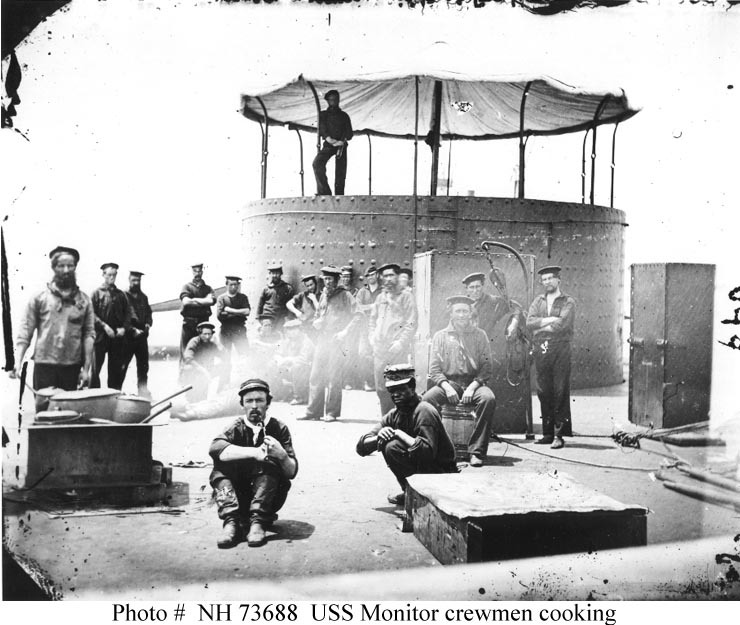 Three Union sailors received short-term concussions when Merrimack's cannonballs hit Monitor's turret. Other than that, almost all hits simply bounced off their targets. 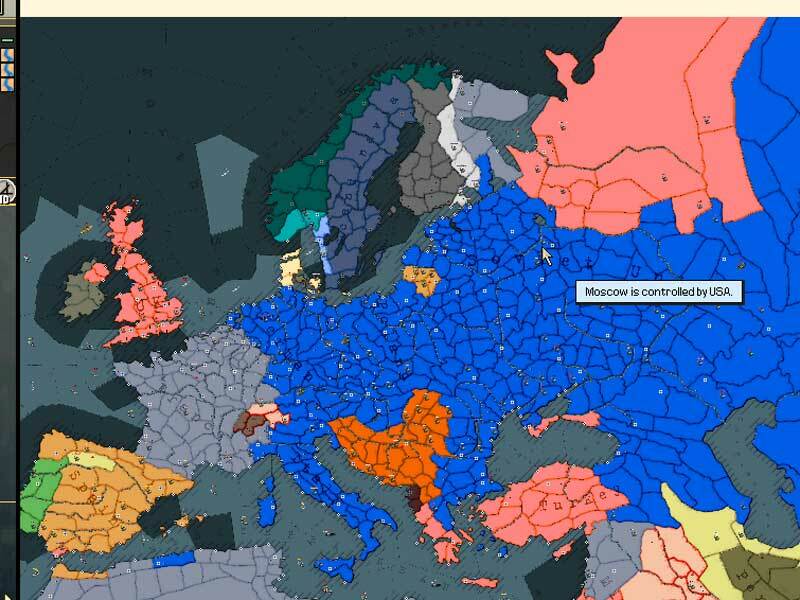 The exception caused the battle to end. 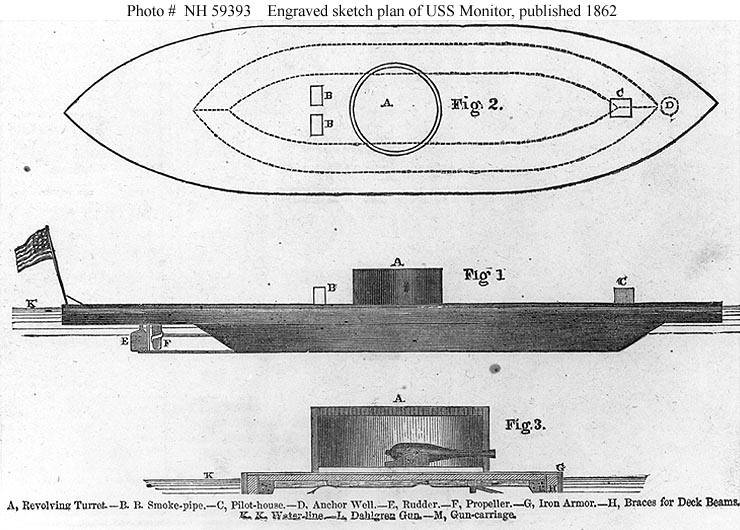 Worden ordered his ship to ram Merrimack's tail in order to disable her rudder. It was only when Confederate gunners, sensing an Achilles heel, focused on Monitor's lightly armored little box-like pilot house near the bow. Concentrating their fire on it, at 11:30 am, they blinded her commander Lieutenant John L. Worden who was in it, causing confusion. Worden ordered Monitor withdrawn to assess the damage. Thinking the fight over, at 12:15 pm Merrimack withdrew as well, returning to Sewell's Point. In spite of contemporary prints showing the skies full of billowing smoke and blazing cannons, it must have been a slow-slogging match since in four hours, Monitor fired only 41 shots and Merrimack 45, a rough rate of 25 shots per hour or one shot every two and a half minutes. The result was a draw, but since the blockade remained, the Union claimed and earned a strategic victory. But in a peculiar footnote, the gunboat USS Whitehall, which had been hit by Merrimack, burned completely in the next day's early hours. And this should remind us all that the Merrimack's success as a warship, in spite of her mechanical problems, weight, and all other issues that go along with a prototype, was stunning. With her 10 guns, she had shamed the 205 guns originally arrayed against her, destroying two large warships and making three others flee and badly damaging one of them. She had sunk one smaller vessel and managed a draw against Monitor. And all this in under 48 hours. Had only she been a part of the US Navy instead of fighting it, it would be easy to make a case that she was the most successful American surface warship ever or at least right up there with the USS Constitution. In fact, it might be hard to find any surface warship over the past 200 years that has been more successful in combat. Merrimack never got a chance to finish Minnesota, which fought later in the war and survived for 39 more years. Monitor and Merrimack were less lucky. Merrimack only sortied once again in anger; Monitor declined to give battle. Merrimack captured three sailing vessels and returned home for repairs. 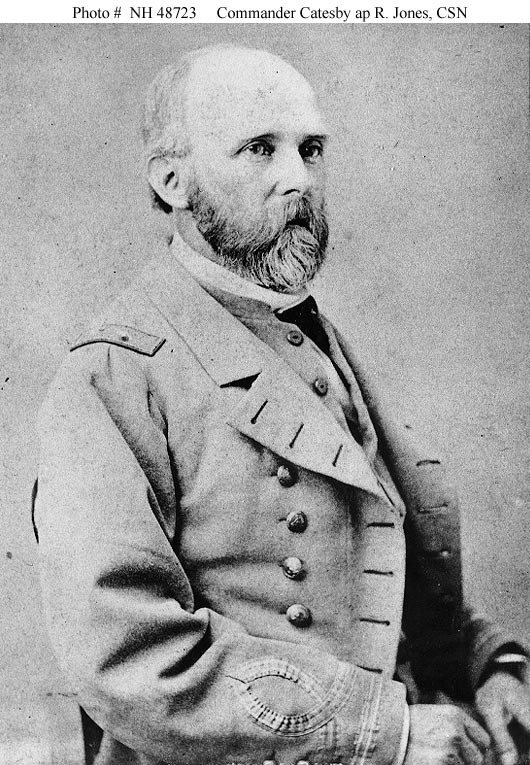 The Union finally recaptured Norfolk on May 10, 1862. 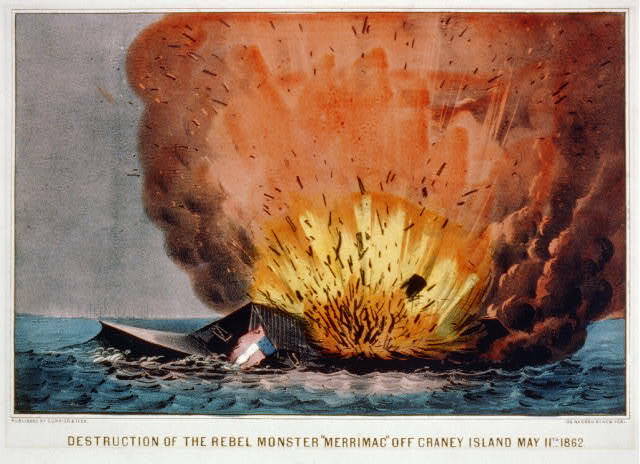 Rather than allow her capture, Merrimack, cornered by land, shallow rivers and Monitor a few miles away was burned off Craney Island, just five miles where she had been resurrected. When fire reached her magazine, she exploded dramatically. This time the phoenix was gone for good. Merrimack explodes (Library of Congress). 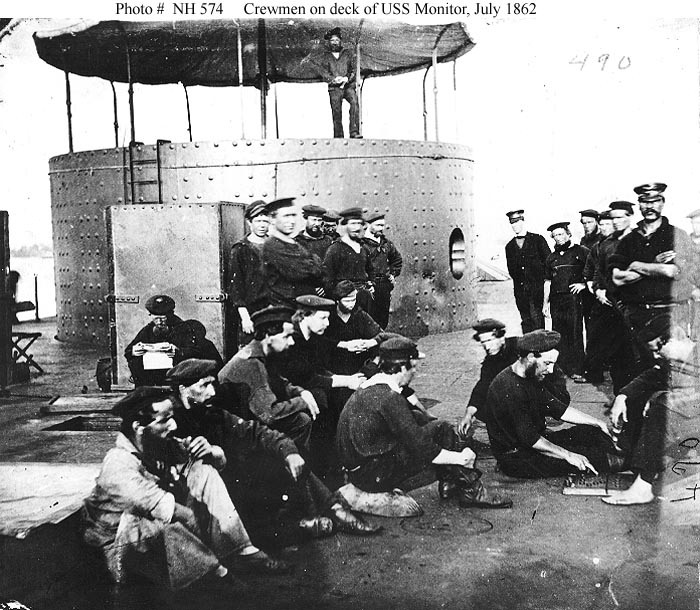 Crew of the Monitor relaxing sometime after her famous encounter with Merrimack. But many of their days were numbered too. Note dents in the armor inflicted by Merrimack's cannons. Note the African-American sailor at center. The US Navy was already integrated. 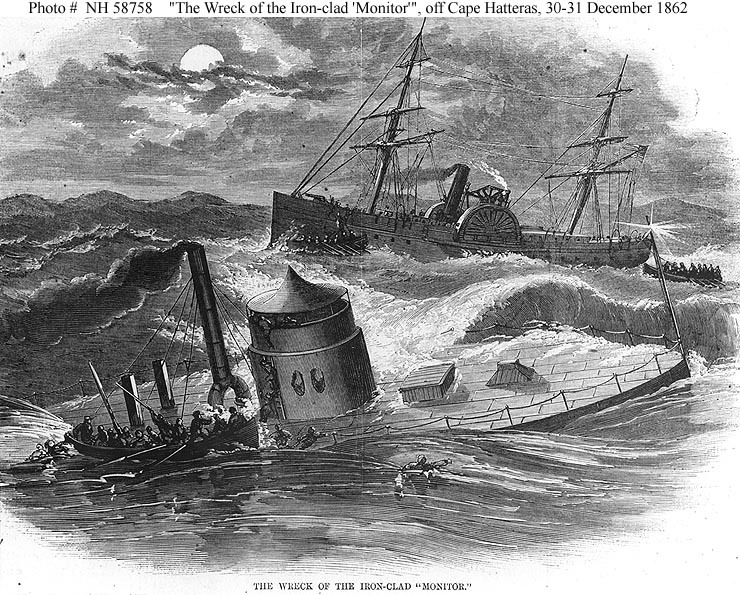 On December 31, 1862, Monitor sank in a heavy gale in the Atlantic Ocean transiting Cape Hatteras, North Carolina losing 16 or her crew of 62. Regardless, both sides built many ironclads over the next few years. Naval warfare would never be the same. And while there is very little to mark where the Monitor and Merrimack fought, Sewell's Point is now the massive Naval Station Norfolk, perhaps the greatest naval base in the world. 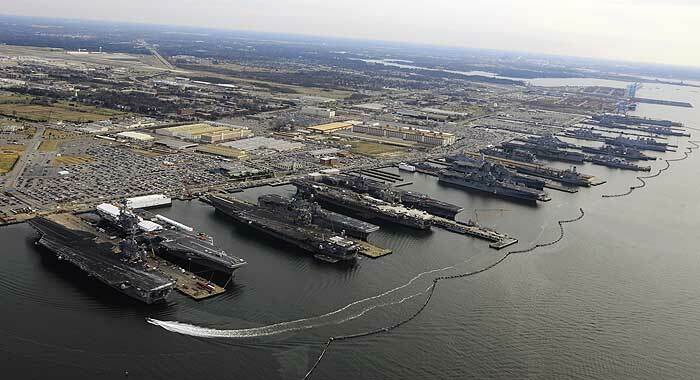 It is homeport to five fleet aircraft carriers, eight amphibious assault ships, seven nuclear submarines, and 34 cruisers, destroyers and frigates among other assets. Looking southeast across Sewell's Point. Merrimack must have anchored approximately where the nearest aircraft carrier is in this photo. 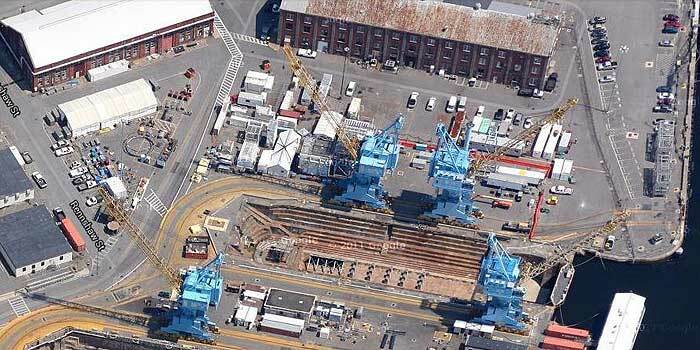 Dry Dock 1 - where USS Merrimack's hulk became CSS Virginia. The large brick building at top center appears to be the one in the lithographs of the reconstruction of the Merrimack. Satellite photography from www.maps.google.com. The Dry Dock Number 1, where Merrimack was transformed into an ironclad still exists in the Norfolk Naval Yard and is preserved as a National Historic Landmark. Monitor's birthplace is mostly forgotten, but Ericsson Street in Manhattan honors her inventor. Ironically, the US Navy's newest stealth warship DDG Zumwalt evokes Merrimack, but that's another story.